Departmentof Chemical Engieering, Sinhgad Technical Education Society, Sinhgad College of Engineering, Pune, India. In the present study the production of biodiesel was performed by using raw material like soybean oil by trans-esterification process. According to the American Society for Testing and Materials (ASTM), the international specification free glycerol in biodiesel should not be more than 0.02 mass %. To achieve the biodiesel with the ASTM specification, biodiesel was separated using prepared PAN ultrafiltration membranes. The polyacronitrile ultra filtration membranes were prepared on supporting material of woven fabric by phase inversion technique of membrane casting. The prepared membranes were characterized in terms of its molecular weight cut off and flux of the membranes. 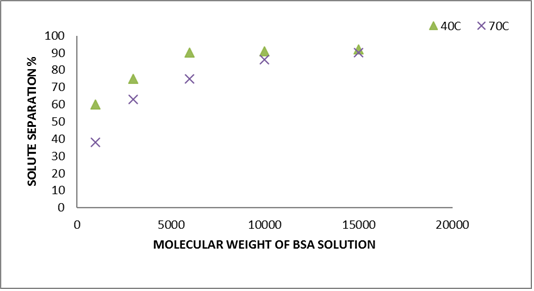 Different molecular weights of the BSA solutions were used to determine the molecular weight cut off of the membranes. Then the obtained 6KDa and 15KDa Ultra filtration PAN membranes were used to separate the glycerol from (FAME) free acid methyl ester. It was observed that the both membranes were separated glycerol from the biodiesel below 0.02 mass % which meets the requirements of the ASTM specification of glycerol. The permeate side of the 6KDa membrane was estimated to be 0.017 mass % of glycerol, whereas, 15 KDa membrane was 0.02 mass % . The glycerol percentage in retained side membranes were increased with time. Day by day, the world population is increasing with geometric proportion. To full fill the need of increased population, fossil fuel sources such as diesel are not sufficient. The energy is an important operator for socio economic development. In order to enhance the safety and sustainability for economic development, renewable energy such as biodiesel seems to be an attractive alternative source of energy [1,2]. Biodiesel as alternative fuel has many advantages over the conventional fossil fuel such as reduction of sulphur, carbon dioxide, and hydrocarbon emission [3,4]. The biodiesel can be blended with conventional diesel to decrease the carbon dioxide emission. Nowadays, many industries are trying to minimize the production cost and improve the quality of biodiesel . The cost of the biodiesel production can be reduced by using suitable feedstock, catalysts, and suitable separation technology in downstream to separate the biodiesel. Biodiesel can be produced by trans-esterification of the long chain fatty acids derived from the vegetable oil and non-vegetable oil such as, algae, animal fats containing triglycerides with alcohol (methanol, ethanol, proponaol) in the presence of catalyst . Mostly basic catalysts are used for trans esterification process,  but the limitations of using these catalysts are formation of by-product during above process. To avoid this, using the enzymatic catalyst can be a great option, however the cost and recovery are the major problems of using this catalyst . The feed stock such as chicken fat, waste cooking oil containing maximum fatty acids and that may produce soap as a by-product. Therefore, while developing the FAME product, we should be careful about the purity of stock which is the most important issue for the biodiesel production . The target is to limit the presence of impurities that may affect the engine performance in both short and long terms. Thus, a great deal of cost and effort are put towards purification of FAME-phase . The unprocessed FAME layer contains impurities such as glycerol (referred to as free glycerol) unreacted methanol, residual catalyst bound glycerol that isunreacted triglycerides TG, diglyceroids DG and mono glycerides and perhaps small amount of soap and water. It is necessary to remove these impurities as they can strongly affect the engine performance. The ASTM D 6751 and EN 14214, standard has given limit to free glycerol content to ≤ 0.02 maximum. After trans esterification reaction process, the mixture are cooled to room temperature. After the two phases are formed, one heavy phase of glycerol rich layer at bottom and lighter FAME phase form at upper layer. Washing of FAME with water remove the soap, catalyst, residue, small amount of glycerol from mixtures, but separation of FAME phase from water phase is usually difficult. After washing step, wash water containing methanol and catalyst residual will be evaporated to recover the methanol and water. In some cases, waste water treated and disposed without further treatment, resulting in loss of product and reactants. In case of feed containing high fatty acid, feed stock resulted in to soap formation. The maximum impurities like soap can causes problem to separate FAME phase (non-polar) from water (polar-phase) because soap form strong surface active agent and create oil in water emulsion. Therefore due to formation of oil in water emulsion may delay in separation time and may loose of esters due to incomplete separation during water washing. Thus there is a need to add certain compound followed by other physical separation techniques. Centrifugation and heating are used in order to break emulsion and improve the efficiency of water washing . Gravity settling is based on the difference in density between the FAME rich phase and polar methanol/glycerol rich phase. Centrifugation setting is also used with water washing to increase the separation of impurities. In centrifuge denser phase are separated to the outer surface of centrifuge, almost all glycerol is easily removed as the glycerol is insoluble in FAME and soluble in water phase. After a sufficient residence time, less dense oil to float on the top of the water surface. This method is less effective for separation of the FAME water emulsion containing small FAME droplets .The time required to completely separate the FAME phase from the emulsion may take several days or never separate. Initial cost and need of maintenance are the disadvantages of the centrifuge . The allowable alcohol level is specified in biodiesel standard (0.2 mass % maximum). This can be achieved using vacuum distillation. In vacuum distillation, water and methanol are removed from FAME to meet the biodiesel standards. The 10 % glycerine is contain in biodiesel will be difficult to separate even if we try to separate by glycerine purification process, reactive distillation, combination of electro dialysis, nano-filtration technique and membrane reactor [13-15]. The transesterification reaction is a reversible reaction. To get higher conversion of reactant, an excess amount of alcohol to oil ratio is required. In the trans esterification different acid, basic and enzyme catalyst is used . Moreover, the biocatalyst or enzyme catalyst can be used in transesterification process. The biodiesel contamination causes serious problems. The presence of a catalyst in biodiesel may damage the injection pump, increasing the corrosion in the engine. The presence of high level of methanol can deteriorate the natural rubber seal and gasket. Whereas, the membrane technology has attracted a great deal of attention from the researchers due to its ability to provide high quality and purity of biodiesel fuel . The membrane biodiesel technology provides product (biodiesel) whose properties met ASTM standard specification. Maria Carolina et al. demonstrated the application of ceramic microfiltration membranes for separation of glycerol at various transmembrane pressures (TMP). They obtained at 0.2 µm microfiltration membranes at 0.2 bar transmembrane pressure give separation of free glycerol below international specification using ceramic membranes. Similarly, Yan et al. worked on ceramic membranes for separation of glycerol and it was observed that residual free glycerol in permeate was estimated to 0.0108 %. Magno et al. studied the separation of glycerol from biodiesel using microfiltration and ultra-filtration membrane, ultra filtration membrane with molecular weight cut of 30 KDa is not suitable for separation of glycerol as per ASTM Standard whereas 10 KDa membranes separate glycerol below 0.02 wt %. Water content in crude biodiesel improves the glycerol removal by membrane separation. In this study, the polyacronitrile ultrafiltration membrane of 15and 6 KDa are prepared by phase inversion techniques, effect of heat temperature on the molecular weight cut of the membrane are evaluated using BSA solution of different molecular weight. The prepared 15 KDa and 6 KDa membranes are used for separation of glycerol. The six liters reactor was used to produce biodiesel (FAME) using batch process. The ratio of oil to methanol was 6:1 for trans esterification process. The catalyst like NaOH 1% mass was taken in the reactor. The reactor temperature was maintained at 60 0C. The magnetic stirrer was used for improving the mixing. The finished products from the reactor biodiesel were taken out to flash after 8-10 h, where the bottom rich layer was removed. The crude biodiesel was taken for separation of glycerol using prepared PAN ultra-filtration membranes. for 24 h to remove the moisture present in the material. Dope solution was prepared by adding 27 gr of ZnCl2 to 638 gr DMF, stirring for 10 h, to get a homogeneous solution and then, 137 gr of dry power of PAN was added and stirred further for 50 h to get a homogeneous solution. The resultant polymer solution was filled in a glass bottle. The air bubble in the resultant polymer solution was removed using ultra-sonification process. Then the dope solution was poured on woven fabric support and the thickness of the membranes was adjusted using casting knife. The casted film was immersed in water (nonsolvent), and after few minutes the phase inversion initiated. Then a thin polymeric membrane film was separated, and the membrane was kept in formalin solution, until membrane evaluation. The membrane was visually inspected for defects and the good area was chosen for membrane evolution. PAN Ultra filtration membranes were dried for few hours at room temperature. Then heated in an oven at various temperature 40 °C and 70 °C for 3-4 min, finally, were taken out from oven and cooled down to room temperature before the test. The PAN ultrafiltration membranes were prepared and characterized in terms of its molecular weight cut off and flux. The molecular weight of the membranes is determined using different molecular weight BSA solution. The permeate concentration of solution is determined by folin lowery method of protein determination. The prepared PAN ultra-filtration membranes were used for separation of glycerol from biodiesel. The cross flow membrane test cell was used for separation of glycerol from biodiesel having an area 160 cm2. Fig.1 shows the effect of temperature on flux of the membranes. The tap water was used to determine the flux rate of the membranes. The casted membranes were heated in oven from temperature 40 to 70 °C to 3-4 min and it was used to find the flux of the membrane using flat sheet membrane module of size 160 cm2. Therefore, the flux of membranes decreased with increasing the temperature from 40 °C to 70 °C. This is occurred due to the heating temperature reduced the pore size of the membranes and membrane thin layer become densified and, hence increased in solute separation at the same time reduce the flux of membranes. Ahmadi et al. summarized that by applying heat treatment technique on polyetherimide (PEI) hollow fiber membranes was a simple and easy approach to improve the performance of hollow fiber membrane contactors for CO2 removal. 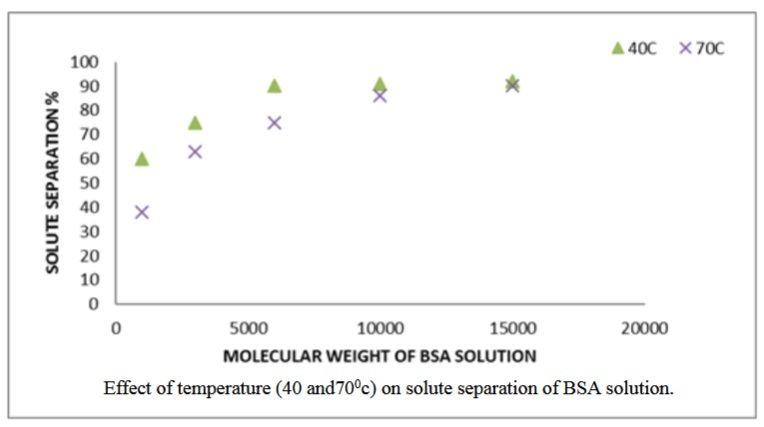 Fig.2 shows the effect of heating temperature on separation different molecular of BSA solution. The molecular weight cut off of the membranes were calculated using test cell of size 10×16 cm for this, the BSA solution of Molecular weight in range 5000 to 20000 Daltons were used to determine the molecular weight cut off of the membranes. 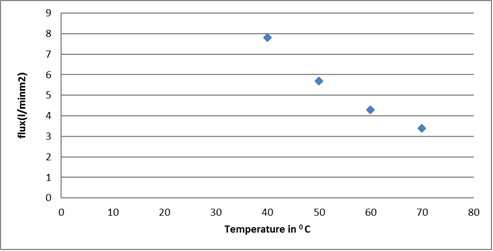 The various molecular weights BSA sample solution of 1mass% concentration was feed to the test cell.As demonstrated in Fig.2, the membranes were heated at 40 °Cand 70 °C, giving more than 90% separation of 6KDa and 15 KDa BSA solutions. As increase in membrane temperature from 40 0C to 70 0C, the molecular weight cut of membrane was increased, due to heating, gases were evolved and roughness parameter was also increased. Therefore, the flux of the membranes was reduced and solute separation percentage was increased. The previous work done by researcher Gholami et al. UF Asymmetric hollow fiber PES Membranes, membrane were heated in an oven at different temperature for the different time period. Gholami reported that the effect of heating reduced the flux and increased the solute separation percentage, as the membrane shrank by heating. Fig. 1. Effect of temperature on flux of the membranes. Fig. 2. Effect of temperature (40 and700c) on solute separation of BSA solution. The crude biodiesel was produced by trans esterification reaction was used to separate free glycerol from biodiesel (FAME). The cross flow membrane test cell was used for separation of the FAME. The initial feed sample was taken before runs. A sample of permeate and retentated sides were taken at a different interval of times. The concentrations of the sample were determined using gas chromatography. The concentration factor and separation percentage were calculated using following formulae. Separation %= retained concentration –permeate concentration/retained concentration Concentration Factor =Initial feed volume/Retained volume at time (t). 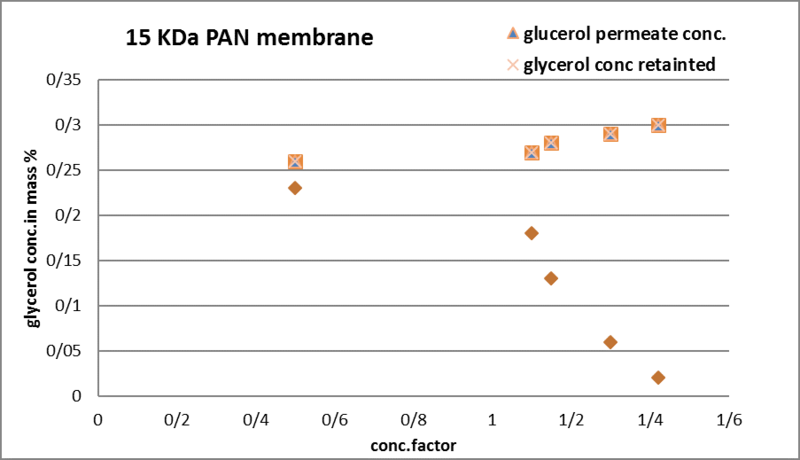 Fig.3 demonstrates that glycerol separation on permeate side increased with increase in concentration factor, for 6 KDa lower molecular weight cut-off membranes at concentration factor 1.4 gives higher separation of free glycerol up to 0.017 %, whereas in retained glycerol concentration remain same. Separation of free glycerol increased with increased C.F which implies that membrane is more selective, it indicates that formation of a selective layer on the surface of the membrane, this allow only small droplet of glycerol as an attempt to pass through the layer. This enhances the separation capacity of membranes. Fig. 3. Effect of concentration factor on glycerol separation using 6KDa ultra filtration. 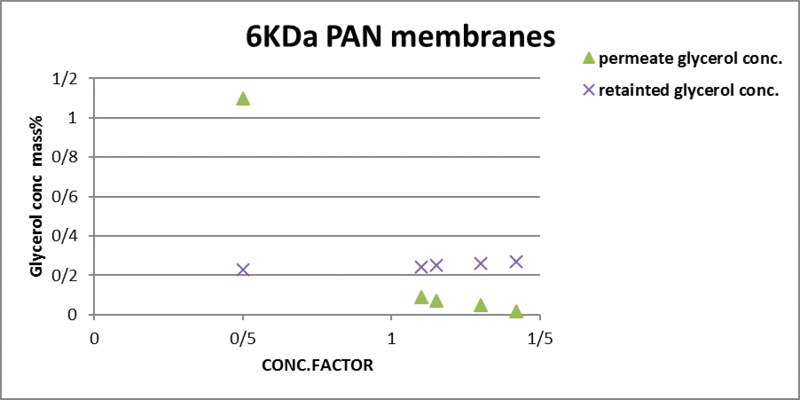 Fig.4 reveals the effect of concentration factor on glycerol separation, resulted in separation on permeate side of the membranes decreased with increasing the concentration factor. Whereas, on retained side of the membranes glycerol percentage remain same. The highest separation of free glycerol up to 0.02 % is obtained at 1.4 concentration factor. It was observed that concentration of glycerol in retained stream remained constant, small polar phase appears at the base of the feed tank, the glycerol mostly accumulates in polar phase. The level of glycerol in retained is constant as FAME in retained remains saturated throughout the run. It is also reported by Jahed et al . separation of glycerol from crude the FAME of trans esterification process using ultra filtration ceramic membranes of different molecular weight cut off at different temperature, it has resulted that after three hours run, at 25 °C and at concentration factor 1.6, all membrane separate the glycerol from free acid methyl ester as per international standard glycerol separation. PAN ultrafiltration membranes were manufactured using the phase inversion technique of membranes casting and made it the application for separation of glycerol from biodiesel. It showed that both membranes that are 6 and 15 KDa were suitable for separation of free glycerol from biodiesel, and met ASTM (American standard of testing machine). The concentration of free glycerol in permeate was reached to 0.02 % for 15 kDa membranes whereas 0.017 % was reached for 6 KDa membranes. The authors would like appreciate the Department of Chemical Technology, Sant Gadge Baba Amravati University, Amravati, Maharashtra, India, for providing facilities to conduct this research study. How to cite this manuscript: Bansod, Praful G*, Rathod, Dnyaneshwar. 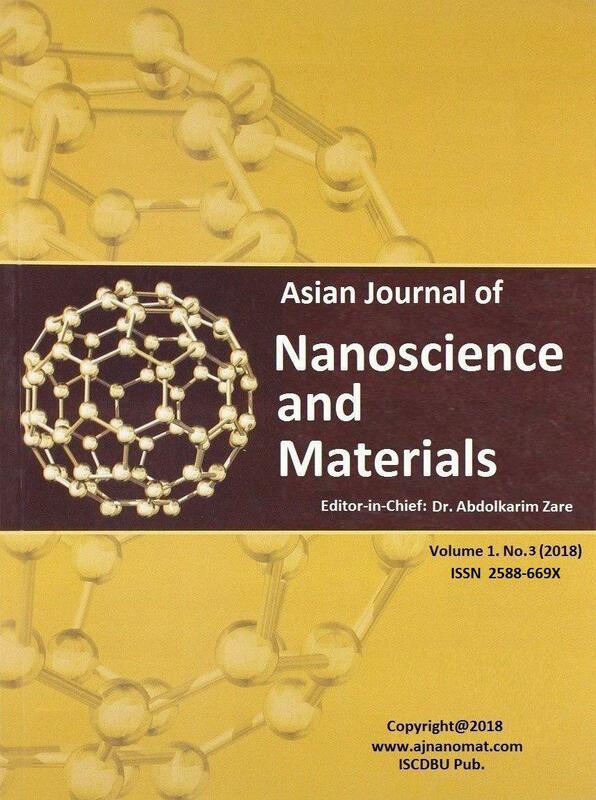 Polyacronitrile Ultra Filtration Membranes Used for Separation of Glycerol from Transesterification Process of Biodiesel production.. Asian Journal of Nanoscience and Materials, 2018, 1, 156-164. 1. Fadhil AB,Aziz AM,Al-Tamer MH. (2016) Energy convers Manag, 108; 255-65. 2. Micic RD, Tomic MID, Kiss FE, Nikolic –Djoric EB, Simikic M (2014) Energy converts manag, 86: 717-26. 3. Fjerbaek, L, Christensen, K.V, and Nordahl B. (2009) Biotechnology. Bioeng, 102:1298-1315. 4. Fukuda, H, Kondo A, and Noda, H. (2001) J. Biosci. Bioeng, 92: 405-416. 5. Atabani, A.E., Silitonga, A.S. and Iran A.B. (2012) Renew Sust Energ Rev, 16:2070-2093. 9. Mao V, Konar SK, Boocock DGB. (2004) J Am Oil Chem Soc, 81: 803–8. 10. Raheman H. (2005) Biomass Bioenergy, 28: 601–5. 11. Becher P. Emulsions: theory and practice. (2001) American Chemical Society. Washington, DC: Oxford University Press; 2001. 13. Nicolae S. (2010) Desalination, 250:1070-1072. 14. Anton, A, Kiss, Costin Sorin Blidea, (2012) J. Chem. Technol. Biotechnol ,87:861-879. 15. Peigang Cao, Andre Y Tremblay, Marc A Dube and Katie Morse, (2007) Ind. Eng. Chem. Res, 46:52-58. 16. Atadashi I.M, Aroua M.K, Abdul Aziz, A.R, and Sulaiman N.M.N. (2011) Renew Sustain Energy, 15(9):5051-5062. 17. Maria Carolina ,Serge Gomes, Pedro Augusto, Arroyo Nehemiah, Curvelo Pereira (2015) Influence of oil quality on biodiesel purification by ultra-filtration. Journal of membrane science, 496: 242-249. 18. Yang W, Xingguo W, Yuanfa L, and Shuze T. (2009) Refining of biodiesel by ceramic membranes separation, fuel processing technology,. 90: 422-427. 19. Magno A, Swellen MN, Lava GP , Mira H M R (2013) Renew energ,58:15-20. 20. Ahmadi, H, Hashemifard S.A, and Ismail, A.F. (2017) Chem. Eng. Res. Des,120: 218-230. 21. Gholami, M, Nasseri, S, Feng, C, Matsuura, T, and Khulbe, K. (2003) Desalination, 155: 293-301. 22. Jahad Sahel, Andry Y, Tramblay and Marc A Dube (2010) fuel, 89 : 2260-2266. 23. Jahed Sahel, Marc A,Dube,Andrey Y, Trembky (2011). Fuel Process Technol, 92(7) 1305-1310.